L. to R.-Keith Aleo, Zildjian Co.- Marc Damoulakis, Cleveland Orchestra- Kevin Jordan, 3rd place, Div. II, Iselin, New Jersey – Michael Jarrett, 2nd place, Div. II, Marrietta, GA. – William DeLelles, 1st place, Div. 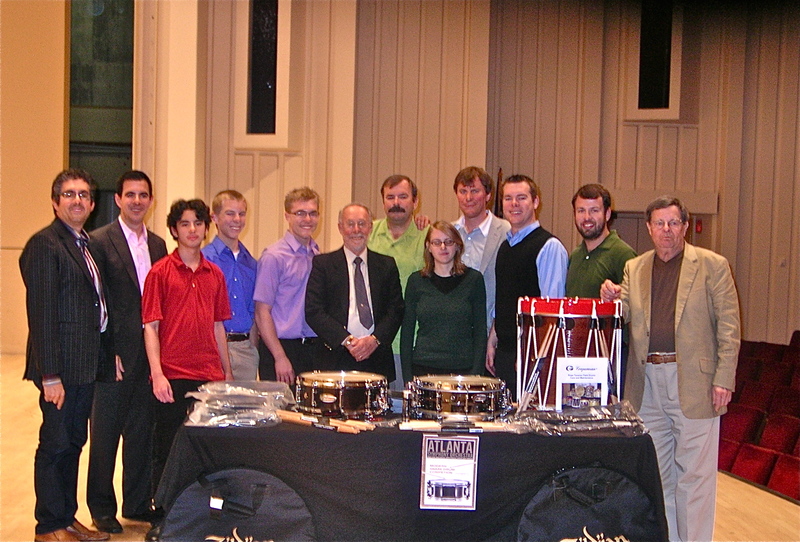 II & winner of Rudimental group, Wintersville, Ohio-Jack Bell, Principal percussion emeritus, Atlanta Symphony Orchestra-James Campbell, University of Kentucky, Lexington, KY-Alyson Rzeszotarski, 1st place, Div. I, Manhattan School of Music- Tom Sherwood, Principal percussion Atlanta Symphony Orchestra, Director, A.S.O.competition – Christopher Jones, 3rd place, Div. I, Eastman School of Music- Kirk Etheridge, 2nd place, Div. I, Indiana University-Robin Engelman. I expected the playing to be of a high quality, but I didn’t expect a solo snare drum performance to captivate me as Hillary Hahn does with her violin. But, that is what Alyson Rzeszotarski, Division I winner, did. Her playing was mesmerizing. Alyson was one of 44 contestants, 31 in Division I and 13 in Division II, who were selected and played during three days of competition in Atlanta, in June of 2009. Given the high quality of the performances, deciding winners was not always easy and when the final round was about to begin, Marc Damoulakis turned to his fellow judges and said, “This is going to be very difficult”. And he was correct. Competitions for classical musicians are career breeding grounds; the winning pianists, violinists and singers, can achieve international notoriety, even fame. In the world of snare drumming, Frank Arsenault (1919-74) came as close as any drummer, before or since, to achieving that status. Arsenault won three United States national snare drum championships. When he retired from competitive play, he taught drum corps and toured nationally giving clinics and master classes for the William F. Ludwig Drum Company. His style was based on the so called standard rudiments of drumming and his recording of the 26 Standard Rudiments is prized today by snare drummers generally and his admirers; people who enjoy, as composer/percussionist Warren Benson put it, “utilitarian music”. That is to say, the four-square music based on military marching, camp duty and drill. A style of drumming civilians will recognize in marching bands, fife and drum and drum and bugle corps. All snare drummers use the same strokes, but, by Benson’s definition, modern snare drum repertoire is not utilitarian. It is in fact very cerebral, intended to tax a player’s technical ability as well as test their comprehension of abstract forms and structures. It is concert music written primarily for staged recitals. The audience for this music is very small. Players of modern snare drum repertoire must, at best, aspire to no more than collegial recognition, broader career ambitions being thwarted by what they play rather than how they play. The winners in Atlanta would not likely become modern Frank Arsenaults. And they were exhibiting only one facet of their music training. Their skills on snare drums would only help them achieve a career if they were also accomplished players of all the instruments modern percussionists are expected to play. These wonderful players were competing to test their mettle. The Atlanta competition allowed them opportunities to hear, and judge themselves against, snare drummers from all over the country. My guess is that most of them were more than a little delighted to appear in the home of the Atlanta Symphony Orchestra, alone and center stage. The competition highlighted some presentation and technical issues worth noting. Some contestants, too few I think; stood side ways to the judges which helped us observe their movements. The majority, as James Campbell observed, were almost invisible behind their music stands. Some played their solos too fast, perhaps more interested in technical than musical clarity. As pointed out by Marc Damoulakis, very few drums were carefully tuned. This created a “choked” sound and loss of clarity and tone. My ears grew weary of pretty much the same ‘tessitura’ from drum to drum. Even when large field drums appeared, bringing a promise of deeper tones, they were pitched to higher, dryer tones then the concert drums. With two exceptions, all the drums had no resonance-ring, a sound I enjoy, but, regretfully, rarely hear. “Ring” is almost impossible to achieve with modern concert snare drums and heads. There were many solos that would have benefited from more resonance. The judge’s backgrounds were diverse and interesting. James Campbell studied rudimental drumming with Mitch Markovich and now heads the percussion department of the University of Kentucky, Lexington where he also plays in the Lexington Symphony Orchestra. I had not met Marc Damoulakis before this competition and we immediately became friends. Like Jim, Marc loves good food and wine. He also has a sense of humor that appeals to me. Tom Sherwood, Principal Percussionist of the ASO, is a quiet and polite man with a temperament well suited to hosting a large competition and announcing victory and defeat. His leadership allowed contestants and judges to perform freely while keeping everything sensible. I had met Keith Aleo of the Zildjian Co. at a recent Percussive Arts Society International Convention, but had never had an opportunity to work with him. I hadn’t seen Jack Bell since the mid-nineties when Nexus played in Atlanta three or four years in succession, and was delighted to learn he would be on the panel. Jack is Principal percussion emeritus of the ASO. After every round, Tom Sherwood told the contestants, “Your level of playing was so high that choosing the winners among you, was very difficult. You are all to be congratulated”. The competitors and judges knew these words were honest sentiments, not gratuitous, nor meant to placate those who failed to move on.